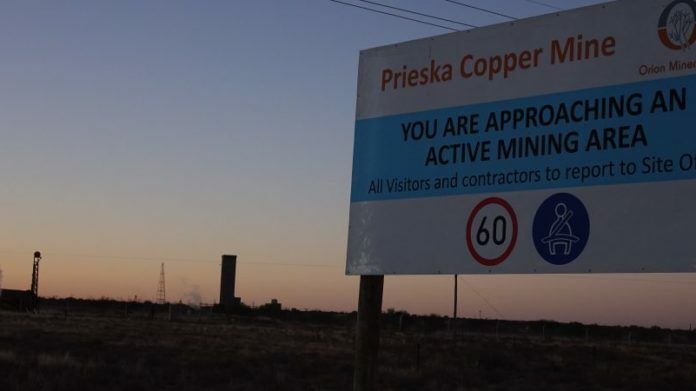 ORION Minerals confirmed press speculation it would raise $8m for its Prieska zinc-copper project after selling shares for $0.04 per share in a placement of which half would be in a black economic empowerment deal. Another “chunk” of shares would be bought by the firm’s largest shareholder, the UK-based Tembo Capital. The shares would be issued at a 30% premium to the firm’s last Sydney-listed traded price prior to the announcement. Further details of the transaction are expected to be unveiled on April 16. “The capital raising is likely to be underpinned by a group of a high-profile black South African investors as part of a broader restructuring of the company’s black economic empowerment at operating level, achieving compliance with the South African Mining Charter 3,” the company said in its announcement. “The inter-related transactions will represent a pivotal milestone for Orion ahead of the expected imminent grant of the mining right for its flagship Prieska Zinc-Copper Project in South Africa’s Northern Cape Province and the delivery of the bankable feasibility study later this quarter,” it said.